“I was very proud then to receive an invitation from The Lord Chamberlain stating that he had been commanded by Her Majesty the Queen to invite Mr and Mrs Ward Turner to attend the Royal Garden party on 31 May from 4pm to 6pm. “What a wonderful afternoon that was, Britain at its best, a chance to dress up and see the Queen and Prince William with the Queen’s Body Guard of the Yeomen of the Guard in their Tudor uniforms of red and gold. We enjoyed music played by two regimental bands and wandered around the wonderful palace gardens and sampled the famous cucumber sandwiches and royal cake with tea dispensed by the royal samovars! JWT’s many fans have been debating which particular contribution from his myriad achievements was selected for this signal honour. Some talked of his multi-faceted acting career, others of his pivotal role in ensuring the general welfare and happiness of Croydon Male Voice Choir. However inside sources have hinted that it was for his rugby activities - both for Westcombe Park RFC and for the Kent county side, including over 54 years committee work and what was termed "general participation". OCTOBER 12: Choir bass Peter Smith gave evidence yesterday at the House of Lords to a commission investigating the benefits of music for dementia patients. Peter, who suffers from dementia himself, testified passionately about how singing brings thrilling physical sensations, aids memory, and inspires a sense of fellowship with other choir members – and he name-checked the Croydon Male Voice Choir while doing so. Peter was one of four speakers at a two-hour session chaired by Baroness Sally Greengross, chair of the Commission on Dementia and Music. Apart from singing with CMVC, Peter described attending two nine-week Singing for the Brain courses, where dementia patients spend an hour singing old favourites such as Danny Boy and Delilah. He told the commission members they would find it “uplifting and inspiring” if they attended a session. Peter also described taking part in a choir which sang at the Alzheimer’s Society candlelit Christmas Service at Southwark Cathedral – another “truly uplifting experience”. Peter received resounding applause for his contribution – the only speaker to do so. He said afterwards: "The opportunity to give evidence in the House of Lords was very satisfying, and I hope that being open in that way will help others. I was most gratified to be the only speaker to receive a round of applause - really moving!" Choir member George Young has just reached a remarkable landmark. It is now sixty years since the Revd George Young, as he is also known, was ordained as a minister in the Anglican church. In that time he has been a vicar in a range of locations, including Everton, Bolton, Buckinghamshire, Tyneside and Beckenham, where his last appointment was at St John’s in Eden Park Road. Although theoretically retired for the past 23 years, George has been active in the leadership team of Christ Church in South Nutfield. Until he and his wife Margaret have also been running Opportunities Through Trade, a company selling fair-trade goods both direct to the public and via local churches. Christ Church celebrated George’s remarkable landmark with a special service followed by a bring-and-share lunch. During a recent Baltic cruise, second tenor Trevor Watkins and his wife Angela visited Helsinki, capital of Finland. 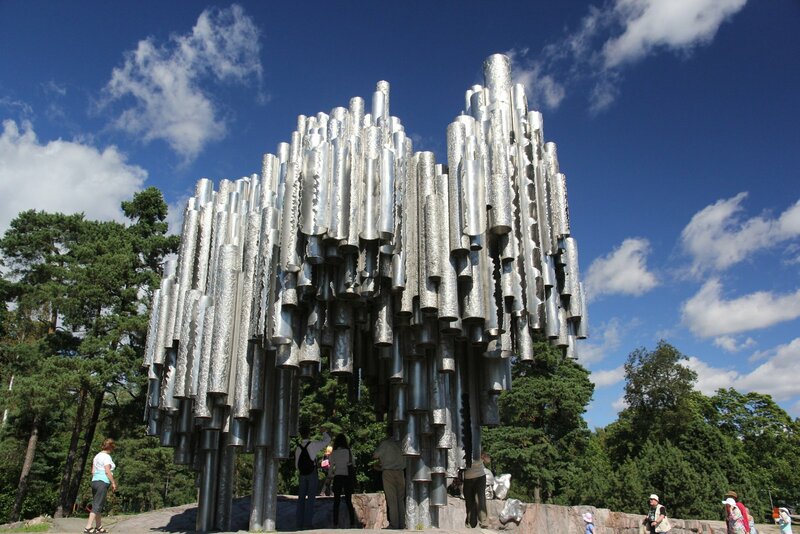 They went to see one of the city’s most celebrated landmarks, the Sibelius Monument, and learned the interesting story behind it. 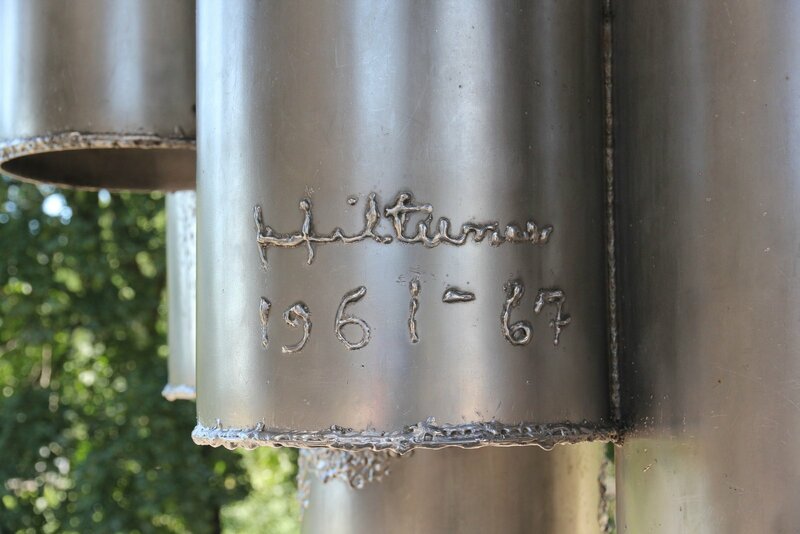 The monument, which resulted from a public fundraising campaign and a competition in 1961-62, is the work of Finnish sculptor Eila Hiltunen. Initially a purely abstract composition reminiscent of a collection of organ pipes, the piece was the subject of heated debate when it was created. Sibelius did not actually compose for the organ; and many Finnish people felt that their most famous composer and national hero deserved better. 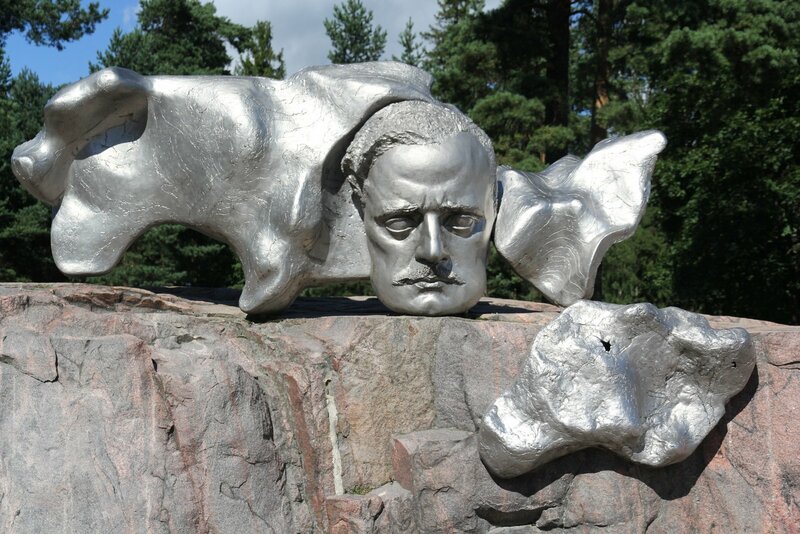 In particular they wanted a figurative element and Hiltunen was eventually commissioned to add a depiction of Sibelius’ face which shows him as he was around 1910, when he was at the height of his creative powers. t is more than fifty years since the unveiling of the monument and the arguments that surrounded its birth have long been forgotten. It is now much loved by Finns and much visited by tourists. A scaled down version can be found outside the UNESCO Palace in Paris, and full-size elements used during the design stand outside the United Nations building in New York and in Montreal. Since 2011, Finland has celebrated Sibelius’ birthday, 8 December, with a flag day. This year will see a number of events to mark the 150th anniversary of his birth, including tribute concerts at this year’s Proms, attended by several CMVC members. No doubt CMVC will observe the occasion with an especially rousing rendition of Finlandia during our concert on 10 December. Signature of artist, Eila Hiltunen. 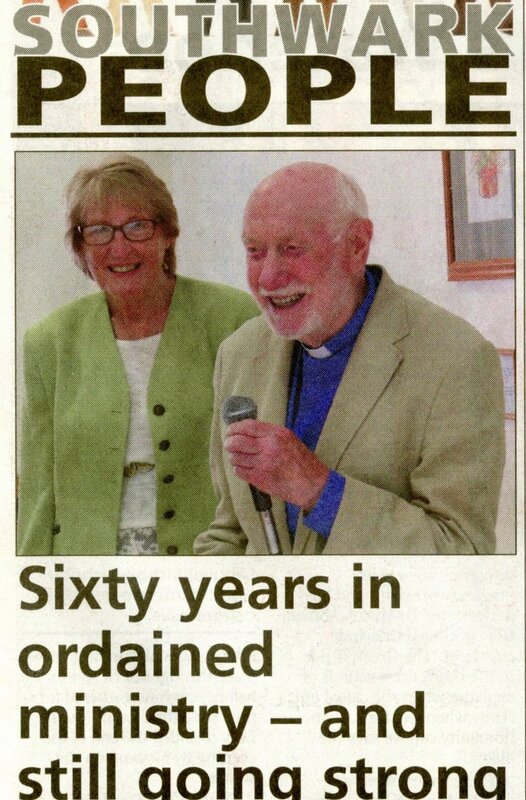 Choir veteran George Stevens and his wife Dot celebrated their sixtieth wedding anniversary at Shirley Park Golf Club on Saturday October 4. Guests included George's fellow top tenors and other close friends from the choir, as well as family and friends from elsewhere. You can knit a sweater sitting by the fire, while Thursday evenings I go to the choir. I love that you need me and you still feed me after sixty years and more. George serenaded Dot with If, the song he performed several decades ago when he auditioned for the tv show Opportunity Knocks. “They gave all the signs of being as much in love as sixty years ago,” one guest said. DECEMBER 13 2016: The Croydon choir celebrated Christmas with two fine concerts in the past three days. The choir sang to the usual intimate audience at Merstham Village Hall on Thursday, then packed in the crowds for its traditional Croydon Welsh concert at Shirley Methodist Church on Saturday. 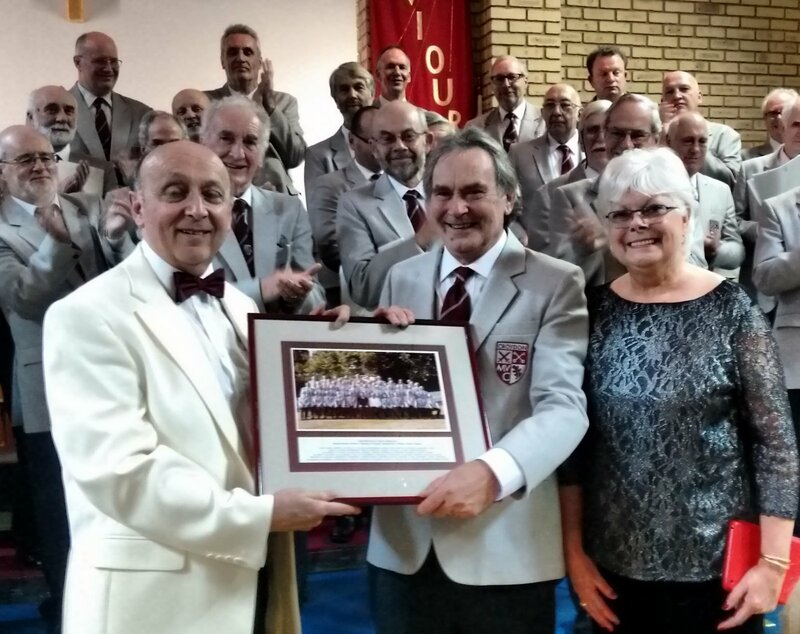 There was also a presentation to two retiring choir stalwarts.